PRP – is this the future of healing? RegenLab PRP therapy is achieving great things in aesthetic medicine, but its extraordinary results extend well beyond face value. When we suffer a cut or fall, the body has a great capacity to heal itself. When we’re injured, platelets in the blood aggregate together, releasing granules as they do so, and become active. These granules in turn release growth factors, and it’s these growth factors that stimulate the inflammatory cascade and healing process. Platelet Rich Plasma (PRP) is used to describe blood plasma with a higher concentration of platelets than the baseline. Platelets are components of blood that are integral in blood clotting and tissue repair. These concentrated platelets contain special proteins that are not only pivotal in the repair and regeneration of tissues but also in initiating new blood vessel formation and connective tissue repair. Given that platelets in the blood play a key role in the body’s natural wound healing response, the role of PRP in skin rejuvenation, either standalone or in conjunction with procedures such as laser and injectables, is gaining a loyal following among aesthetic practitioners for its ability to rejuvenate and smooth the skin. However, PRP extends well beyond skin rejuvenation. With a history spanning decades in the medical industry, it has been used in orthopaedics, sports medicine, wound healing, surgical healing, dentistry and ophthalmology. The tissue repairing effects and the various kinds of growth factors released by PRP regenerate tissue, and a growing body of literature is reporting its ability to help tissues heal and function normally in many areas of medicine and after certain types of surgery. PRP: the missing link in musculoskeletal medicine? Dr Philip Lim, Master of Medicine in Physical (musculoskeletal) Medicine (Sydney) and owner of Northside Physical Medicine in Sydney, is one such doctor espousing the bene ts of PRP for musculoskeletal medicine. His interest is in orthopaedic regenerative medicine using prolotherapy technique, injecting PRP to the target sites of joints, weakened joint ligaments or tendon tears to restore function and anatomy. In 2004, he introduced the advanced technique of prolotherapy, a non-surgical approach to regenerating ligament laxity, to his practice and is the first medical practitioner in Australia to gain certification in prolotherapy from the American Association of Orthopaedic Medicine. In 2010, he introduced PRP to his practice as a substitute for dextrose, delivering a superior prolotherapy injectant in musculoskeletal regenerative treatment. He now uses PRP for tendon tears as well as restoring osteoarthritic joints, using ultrasound-guided injections. ‘My primary goal is to provide comprehensive treatment for all biomechanical musculoskeletal disorders – from back pain to jaw pain – and to provide non-surgical approaches for treating pain,’ he says. ‘I believe the missing link in musculoskeletal medicine is PRP.’ Dr Lim was recently invited to present on the regenerative capabilities of PRP in musculoskeletal medicine at the first RegenLab BioBridge Asia-Pacific Conference in February 2018, which was held in Sydney. ‘The musculoskeletal system is an integrated framework which supports the weight of our body, allowing us to rapidly adjust to resist external forces, and permit us to move freely in our environment without compromising structural integrity,’ Dr Lim explains. Degradation and trauma of ligaments lead to unstable joints and results in the ‘wear and tear’ of joints. Osteoarthritis is testament to this, and potentially gives rise to myofascial pain with resulting muscle shortening and tightness as well as nerve impingement particularly where it penetrates through muscle. When treating the osteoarthritic joint with PRP, Dr Lim advises to consider the ligament laxity contribution to joint dysfunction and inject the ligament with PRP in addition to the joint. ‘Consider also the tensegrity model in human biomechanics and look for a possible primary lesion if the affected joint has no history of direct trauma,’ he adds. PRP has been used for decades in different medical arenas – from sports medicine to helping treat osteoarthritis. RegenLab PRP was the first to market PRP in the Australian aesthetic arena in 2007. Now, with well over 145 clinical studies backing it, RegenLab PRP is a proven PRP system using optimal concentrations and offering consistent results. With RegenLab PRP, most of the growth factors are in the platelets. These growth factors are released at the site of injection in an orchestrated manner by the activated platelets, thus providing the right dose and the right growth factor cocktail at the right time of tissue reconstruction. Comparative studies have shown that RegenLab PRP obtains quality large dense platelets. The content in growth factor per platelet is higher in RegenLab PRP than in competitor systems. RegenLab PRP yields quality platelets with full functionality in physiological conditions (pH 7) with virtually no undesired cellular contaminants in the highly therapeutic domain in which RegenLab PRP has been tested. RegenLab’s five minute harvesting time ensures viable dense platelets are captured that, in turn, release abundant growth factors. Designed to yield the optimal concentration of blood platelets, it gives physicians the option to increase the platelet concentration to four times the patient’s baseline if required. This is an area of medicine that is growing. Every year PRP is attracting more practitioners and patients because of the regenerative results it produces and increased knowledge of how it can be used. While PRP technology is utilised in a variety of ways, the so-called Vampire Facelift arguably remains its most famous application. Developed by Dr Charles Runels in the US, and popularised by celebrities like Angelina Jolie and Kim Kardashian West, PRP has been used in aesthetic medicine in the UK, Asia and Europe to rejuvenate and slow down the ageing process since 2006 and was approved for use in Australia in January 2009. PRP contains a cocktail of complexion enhancing ingredients – like growth factors and cytokines – that stimulate anti-ageing activity after being re-injected back into the skin. Specifically, growth factors are involved in stem cell migration, differentiation and proliferation, as well as stimulation of fibroblasts and endothelial cells to induce new collagen and blood vessel formation. As well as the platelets, the plasma itself contains many factors that are essential for cell survival. These include nutrients, vitamins, hormones, electrolytes and proteins. There are also essential molecules to help build a scaffold for the formation and migration of new cells. RegenLab PRP has successfully been used to enhance facial volume, plump and fill in fine lines and wrinkles, and promote a more youthful and radiant complexion. It can be used in the delicate areas around the eyes and mouth, where dermal fillers, lasers and neurotoxins may not be as effective. 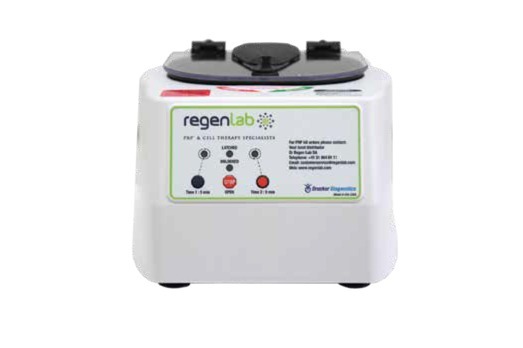 Although there are several PRP systems on the market today, RegenLab PRP has a unique centrifugation process. Typically, 10ml to 20ml of blood is collected in one or two RegenLab PRP devices.